Europe is currently facing a refugee crisis as it struggles to deal with an influx of people fleeing conflict. In 2015 alone, over 160 thousand refugees arrived in Sweden. Forty thousand still don’t know if they will be allowed to stay in the country. Afghan and Swedish cultures are worlds apart. For Afghan asylum seekers arriving in cold Sweden, the transition isn’t always straightforward. But as Ric Wasserman reports from Stockholm, a new project is aiming to ease the way. A tightly packed showroom and workspace in Stockholm is filled with textile designs. Afghan and Swedish patterns combine to make entirely new and unique creations. This is stage one of the Craft and Integration project - An initiative that is partnering newly arrived young Afghan rug and textile makers with Swedish designers and rug experts. “We should work with young people coming to Sweden who bring a lot of knowledge from their own home countries and they can also teach us something about patterns, traditions, and techniques and things like that,” said Anna Forsberg, the Swedish project director. Anna sees lots of untapped potential here. Young refugees have brought with them incredible skills in centuries-old Afghan weaving traditions. She says this is a great opportunity for artistic development, and she’s keen to build a two-way cultural exchange, and a thriving business. 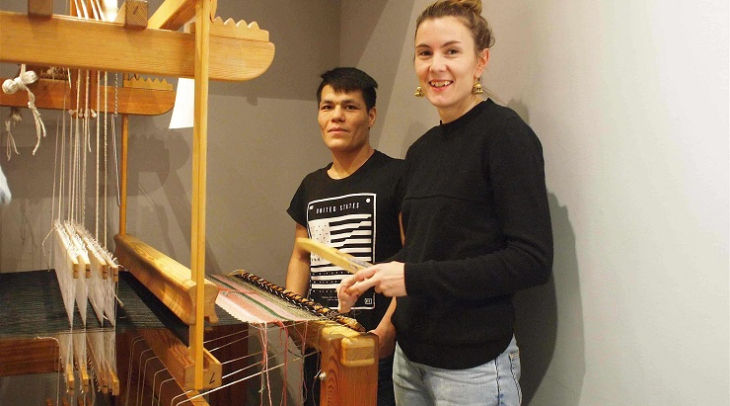 “When so many refugees came to Sweden in 2015 I thought that maybe I should do something in Sweden as well that connects to textile and design,” Anna recalled. Thirty five thousand unaccompanied children and adolescents sought asylum in Sweden in 2015. Half of them are young boys from Afghanistan. Many have little formal education. But some of them are talented textile and rug craftsmen. Back in her shop, Anna demonstrates how to use a Swedish loom for Abedin Mohammedi. Now 18, Abedin arrived in Sweden two years ago. He’s been involved in the Craft and Integration Project for 6 months. Back in Afghanistan, Abedin sat by his mother on the kitchen floor, and learned to make rugs from the age of eleven. He effortlessly gets the hang of the Swedish loom, and is confidently weaving within five minutes. But he’s not convinced this is for him. Making a handwoven rug is time consuming. Anna has just ordered a loom from Afghanistan. And when Abedin hears that, he brightens up. It’s something he knows about: “I can do that. If they get an Afghan loom I can teach others,” he exclaims. Stina Lanneskog is a textile designer and concept developer, and Anna’s partner in the project. She tells me that guys like Abedin might surprise themselves. She’s all about working as a team to expand people’s creativity. “I can teach them through the design process and being creative that you can do so much more than you know,”she stated. Stina tells me they started the creative process with an experiment: The Swedes drew typical traditional Swedish patterns on paper, the Afghan boys: patterns from their tradition. Then they cut them out, and mixed them up. “Everyone had their shape and then we together placed it on this black paper. It’s a quick and quite visual way to see how it will become in the end,”she explained. At the project launch I noticed people looking at the Afghan-Swedish textile mix. They looked pleasantly puzzled. I remembered what Stina had said about the piece. That’s the whole idea- to create an entirely new design, spanning two very different cultures. With his creations in the public eye, Abedin is looking rather proud. Far from his family, surrounded by a new language and culture, Abedin has faced plenty of challenges since arriving. Despite all that, he tells me that he hopes he’ll be allowed to stay. “Sweden is a good country. There’s freedom of movement, I can go to school. I can work. It’s good for me here,” he said.